The North American Handmade Bicycle Show (NAHBS) made its second appearance in Sacramento over its 11 year history. More than 175 custom bicycle builders and bicycle related merchandisers took up most of the exhibition space in the Sacramento Convention Center. NAHBS keeps getting bigger and better and with an increasing number of bike builders from Asia and Europe participating this show has grown to become an international exhibition. 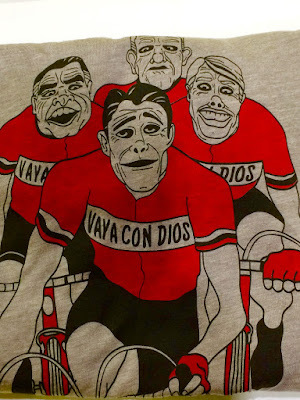 If you're a bike geek, it was time to affix a drool cup to your chin. The exquisite craftsmanship and attention to detail of the bike builders are beyond belief. They are as much amazing artists as they are engineers/craftsmen. It's winter time in Sactown so it's time to head south. Mexico City, known for its cutting edge architecture and modern art, has been on my bucket list for sometime and I finally decided to fit it into my travel schedule this year. Road Scholar, a travel company I have not toured with before, offered an intriguing program which took in three fascinating colonial cities - Guanajuato, San Miguel de Allende, Queretaro - in addition to Mexico City. I knew nothing of these cities but friends spoke highly of them so I decided to sign up. Five other friends from Sacramento - Tom Graham, Peter Saucerman, Susan Twining, David and Kristina Vandershaf - were also interested in the trip and decided to sign on. The "Sactown Six" joined 18 other travelers from across the U.S. and Canada for the Road Scholar Tour named "Mexico's Orgins: Silver, Culture and Revolution." Road Scholar tours are known for its educational component and our daily itinerary included lectures by a historian on the history and culture of Mexico. And in particular, the relevance of the cities to be visited to its history. In addition, two local guides led the tours of the sites we visited. The tour was very well organized and very interesting. We learned a lot over the 14 days of the tour. The Road Scholar program - itinerary, lodging, food, transportation and staff were all great. There will be more Road Scholar tours in my future. Guanajuato, a World Heritage site, was the first of four cities we visited. As it turned out, of the four cities, Guanajuato turned out to be my favorite (as well as for many of the others). From an engineering standpoint, Guanajuato has a unique street system of tunnels interlaced under the city due to it being sited in a steep gorge. The city is a visual feast for the eyes with the homes painted in bright colors as it rises up the two mountainsides. The architecture, city parks, lively street life, especially at night, made this city a most memorable experience. 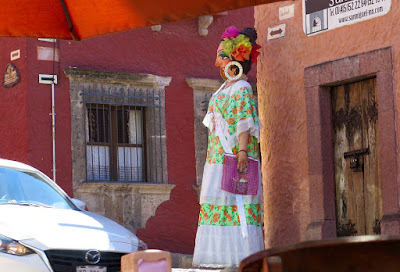 There are individual blog posts for the other three cities - San Miguel de Allende, Queretaro and Mexico City. After viewing each post, return to the homepage, scroll to the next city and click the link to the relevant photo album. The second city on the tour was San Miguel de Allende, a small artsy city with a population of 140,000. San Miguel is a popular retirement city for Americans and approximately 9,000 ex-pat Americans reside here, mostly year-around. We spent three days in San Miguel. Being a fairly compact and upscale city with colorful streets, nice parks, and historic town center, it is a very pleasant town to just wander and hang. The third city on the tour was Queretaro, a growing suburb to MX City with a population of 800,000. Many industries have located in the city's periphery but the historic district is well preserved and very lively at night. We spent three days in Queretaro with a day trip to a small colonial village of Bernal, known for its towering monolithic rock formation. Mexico City was the fourth and last city on our tour. With a city population of 9 million and a metropolitan population of over 21 million, it is the largest metro city in the Americas. The Road Scholar tour encompassed three days but we (Tom, Peter, Susan and I) added three additional days to see more of MX City on our own.